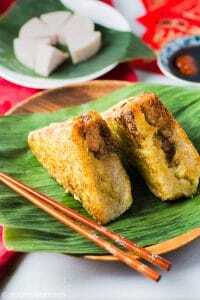 Vietnamese Square Sticky Rice Cake (Banh Chung or Chung cake) is a must-have in the Lunar New Year celebration of Vietnam. Despite being made from simple ingredients, this traditional cake tastes wonderful and holds beautiful cultural meaning in it. All people in Vietnam, including little kids, know this story by heart. Once upon a time, a Viet king held a competition in which each of his sons would need to bring a delicious dish to honor the ancestors on the occasion of Lunar New Year. Whoever brought the most delicious dish would be the next king. 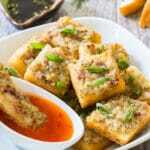 The poorest son of the king created Banh Chung from very simple and familiar agricultural produce. With a square shape and green outer layer, the cake symbolizes the Earth. 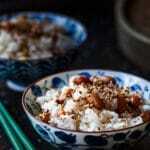 The main ingredient is sticky rice which was one of the most important foods to ancient Viet people. 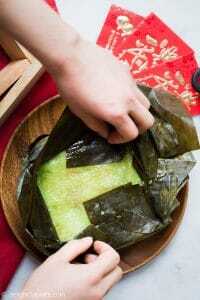 Hidden inside the sticky rice layer is the delicious filling made from mung bean and fatty pork. This cake is a beautiful representation of respects for ancestors and Mother Nature. The King was so impressed with Banh Chung that he decided to pass the throne to its creator. 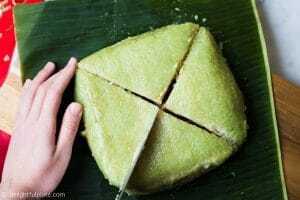 Ever since then, Square Sticky Rice Cake has become an important component in Vietnamese Lunar New Year Feast. The cake is delicious with fragrant rice, creamy mung bean filling, tender pork and some heat from plenty of black pepper. 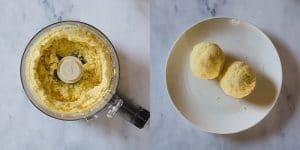 We learned how to make Banh Chung four years ago because we can’t easily buy a good one here. The main ingredients are easy to find, and although the process takes a whole day, it is so worth it in the end. 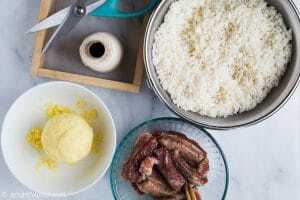 To make Vietnamese Square Sticky Rice Cake, you’ll need long-grain sticky rice, split mung bean, pork belly, salt and a lot of freshly cracked black pepper. Some may prefer pork shoulder, but I like to use somewhat meaty pork belly. Make sure you use pork with fat because we want the fat to melt into the filling after long hours of cooking. Sticky rice and mung bean need soaking overnight. I always steam the mung bean and mash or process very finely in a food processor. That way, it makes the filling so creamy and melt in the mouth. 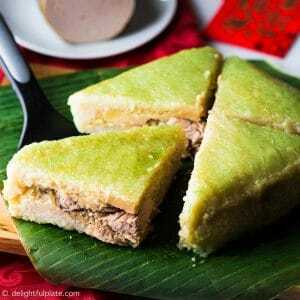 Some people just put raw mung bean directly in the cake, so if you are short on time, I guess you can do so. 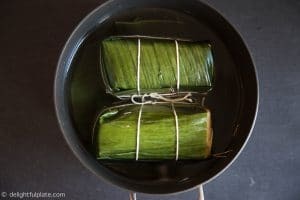 Traditionally, Banh Chung is wrapped in dong leaves which I can’t find here. Instead, we use banana leaves which you can find in the freezer at a lot of Asian grocery stores. The leaves give the outer rice the bright green color. Thaw them in the refrigerator from the night before and wash and pat dry right before wrapping the cake. Washing the leaves will ensure the cake stay good for a fair amount of time. When my mom was a kid, my granddad always gave her this task and she hated it because she had to touch cold water for so long in winter. We use a wooden mold to make wrapping more easily. As far as I know, the mold is not commercially sold outside of Vietnam. However, you can make one yourself from wood or other sturdy materials. Ours is 6×6 inch. Arrange a clean working station and put the clean banana leaves, kitchen twines and a pair of scissors near you and get started. We made a short clip to show you how we fold and place banana leaves in each corner. You may notice that the piece we use in the clip got torn a little bit because we redid the clip quite a few times. Please make sure you use a piece of leaves that isn’t torn :). The step-by-step photos are in the recipe card. Once the leaves have been laid out, we can start putting ingredients inside. 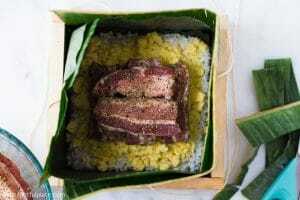 Start with one layer of sticky rice, then one layer of cooked mung bean and pork belly. Put one more layer of mung bean and a final layer of sticky rice on top. 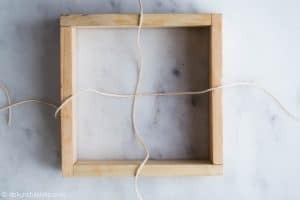 Then we just fold the leaves down to close the parcel and tie around it with kitchen twine. Traditionally, Vietnamese people make tens of Chung cake and put them in a very big and tall pot. They then fill the pot with water and boil over wood fire for 12 hours. We boil the cakes on our stovetop for 10-12 hours depending on how many cakes we make. After boiling time is over, the cake needs to be pressed under heavy objects for a few hours to remove excess water. After pressing the cake, you can peel off the leaves and serve it immediately. Cut into four or eight slices depending on how big you like. Eat it on its own or with Vietnamese pork sausage (gio lua) and/or with soy sauce. 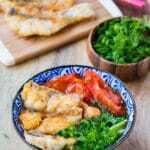 You can also pan fry it which will make it crispy and more delicious. I can eat this cake for any meals in the day. Leftover can be stored in the refrigerator for a few days. After removing from the refrigerator, you can either microwave or fry it. The cake can also be frozen. If you freeze the whole cake, it’s best to re-boil them for 1-2 hours. If you only freeze a few slices, you can thaw in the refrigerator and reheat in microwave or fry it. If you are not confident with your wrapping skill, you can reinforce the cake by wrapping it with a layer of aluminum foil. I like to start wrapping in the morning so I can finish boiling the cake before bedtime and then let the cake pressed overnight. I hope you will give this traditional cake a try. You may be able to find it at some Vietnamese grocery stores or Vietnamese restaurants. Finally, Happy Lunar New Year to you and your family! Soak the sticky rice in a lot of water. Also soak mung bean in plenty of water. 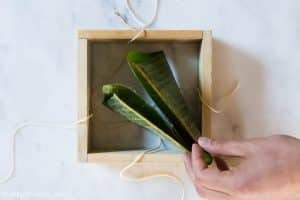 Move banana leaves from the freezer to let it thaw in the refrigerator. Slice pork belly into same sizes, about 1 inch thick, 3 1/2 inches long and 1 1/2 inches wide. Add 1 teaspoon of salt and 2 teaspoons of black pepper, mix well and set aside. Drain the rice and sprinkle 3 teaspoons of salt over it, mix to combine. Set aside. Drain the mung bean and sprinkle 1 1/4 teaspoons of salt over it, mix to combine. Steam mung bean until it's soft, about 15 minutes. Then either mash it or process it finely in a food processor. You can taste and add more salt if needed. 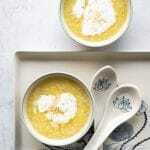 When mung bean is still warm, divide into 2 equal portions and form each portion into round balls. Wash banana leaves and pat dry. Place your cake mold on a clean surface. Arrange two strings cut from kitchen twines as in the photo below. The strings will be used to tie around the cake so make sure they are not too short. 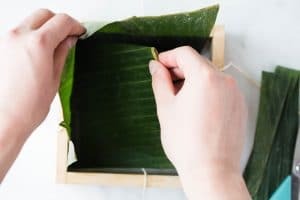 Cut four pieces of banana leaves so that when you fold them in half and fold in half one more time, the folded piece fits inside the mold. 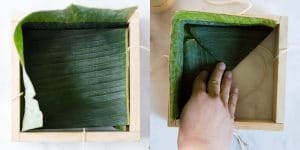 Put one folded piece of banana leaves inside the mold in an upright position against one corner of the mold as in the image below. Pull the top corner down towards the bottom clockwise. Lay flat and pull the farthest corner up to form a triangle at the bottom. Continue to do the same for the other three pieces and put each of them in each corner. Note that for the last two pieces, you don't need to pull the corner to form a triangle. Cut another four smaller pieces of banana leaves, about half as big as the previous ones and repeat those steps. This step will make sure the rice and mung bean are safely secured. Once the leaves have been laid out, we can start adding ingredients. Scoop 1 cup of rice and pour into the mold, lightly spread and push the rice into an even layer. 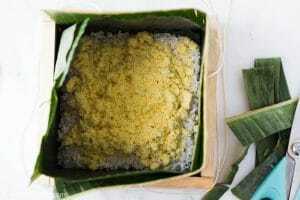 Use your hands, break one of the mung bean ball in half, then hold one half above the rice and break into smaller pieces and spread over the rice. Add half of the pork belly into the center over the mung bean. Hold the other half of the mung bean ball above the pork belly, break into smaller pieces and spread over the cake center. Then finally top with about 1 1/4 - 1 1/2 cups of rice. Push some of the rice to the side and corners. Fold the banana leaves down and press gently. Tie the two strings around the cake as below. Remove the mold and tie two more strings around the cake. 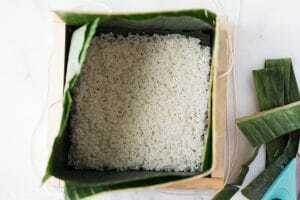 The rice will expand so don't tie too tightly. Now you can flip the cake over and it will look as in the photo. Using the remaining ingredients to make another cake following the same steps. Line a large pot with 1-2 pieces of banana leaves. Put the cakes in the pot, then fill the pot with water to cover the cakes. To prevent the cakes from floating, place heavy objects on top of them to weigh them down. I use two ceramic bowls. Bring the water to a boil and then adjust the heat to remain a low-moderate boil. Cover and cook for 10 hours. Once in a while, check to see if there is still enough water to cover the cakes. If not, add some boiling water. After 10 hours, remove the cakes from the pot and rinse under water until the outer leaves are not sticky. Place the cakes on a rack over a baking sheet. Place another baking sheet on top and put some heavy books on top to press the cakes for at least 2-4 hours. Chung cake can be served immediately after the pressing step. 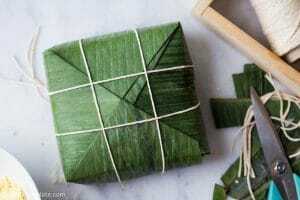 Peel off the banana leaves and cut into 4 or 8 slices. 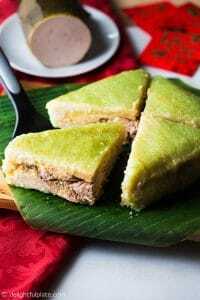 Eat the cake on its own or with Vietnamese pork sausage and condiments such as soy sauce. You can also fry the cake slices until all sides are golden and crispy. The cakes can be stored in the refrigerator for a few days to a week. Reheat by microwaving or frying. You can also freeze the cakes for a few months. Thaw the cake in the refrigerator and then boil it for 1-2 hours before eating. This recipe makes two 6'' x 6'' cakes.